Said to have been in private ownership in Georgetown, South Carolina, whence purchased by a New York dealer (perhaps Charles Henry Hart). Philipse Manor Hall Museum, Yonkers, New York, by 1910; from which it was purchased c. 1917, with the rest of the property, by (C.W. Lyon, New York); sold 5 March 1917 to Thomas B. Clarke [1848-1931], New York; sold by Clarke's executors to (M. Knoedler & Co.), New York, from whom it was purchased 29 January 1936, as part of the Clarke collection, by The A.W. Mellon Educational and Charitable Trust, Pittsburgh; gift to NGA, 1947. 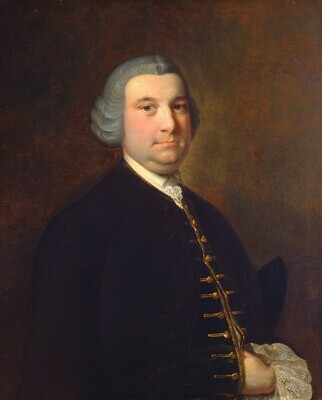 According to notes on the Clarke collection in NGA files, Charles Henry Hart and Thomas B. Clarke were closely associated in assembling portraits for Philipse Manor Hall over a five-year period. Acquisition date according to 1928 Clarke exhibition catalogue annotated with information from files of M. Knoedler & Co., NY (copy in NGA curatorial records and in NGA library). Portraits Painted in the United States by Early American Artists, The Union League Club, New York, February 1922, no. 11, as Josias Allston by Jeremiah Theus. Portraits by Early American Artists of the Seventeenth, Eighteenth and Nineteenth Centuries, Collected by Thomas B. Clarke, Philadelphia Museum of Art, 1928-1931, unnumbered and unpaginated catalogue, as Josaias Allston by Jeremiah Theus. Exhibition of Early American Portraits on Loan from the National Gallery of Art, Washington, D.C., Pack Memorial Public Library, Asheville, North Carolina, 1949, no. 2, as Josias Allston by Jeremiah Theus. The Face of American History, Columbia Museum of Art, South Carolina, 1950, no. 19, as Josias Allston by Jeremiah Theus. American Portraits from the National Gallery of Art, High Museum of Art, Atlanta, 1951, no. 3, repro. (organized by the Atlanta Art Association). The lightweight canvas is finely plain woven; it has been lined. The ground is cream colored; it is thickly applied and almost masks the weave of the canvas. The painting is executed in thin layers in the costume, thicker and more opaque paint in the flesh tones, low impasto in the highlights, and thin glazes in the background. The figure is moderately abraded; the background is severely abraded and has been heavily overpainted. There is an inverted L-shaped tear in the upper right quadrant, 16 cm. in length; areas of retouching are concentrated here and at the center of the bottom edge. The thin natural resin varnish has discolored yellow to a moderate degree. American Paintings and Sculpture: An Illustrated Catalogue. National Gallery of Art, Washington, 1970: 164, repro., as Portrait of a Man. European Paintings: An Illustrated Summary Catalogue. National Gallery of Art, Washington, 1975: 376, repro., as Portrait of a Man. American Paintings: An Illustrated Catalogue. National Gallery of Art, Washington, 1980: 309, as Portrait of a Man. European Paintings: An Illustrated Catalogue. National Gallery of Art, Washington, 1985: 439, repro. Hayes, John. British Paintings of the Sixteenth through Nineteenth Centuries. The Collections of the National Gallery of Art Systematic Catalogue. Washington, D.C., 1992: 340-342, repro. 341.